The hat itself was pretty cute, I made a baby size with a brim. But it seemed to be lacking that… pop. Crochet hats in solid colours can be a little underwhelming sometimes, and it’s a baby hat – they’re supposed to be adorable! So the pattern feature is really for two crochet patterns that I found. Last night, after the hat was finished, I took some time to search Ravelry for a lovely floral addition to my hat, and found the fantastic pattern used below! 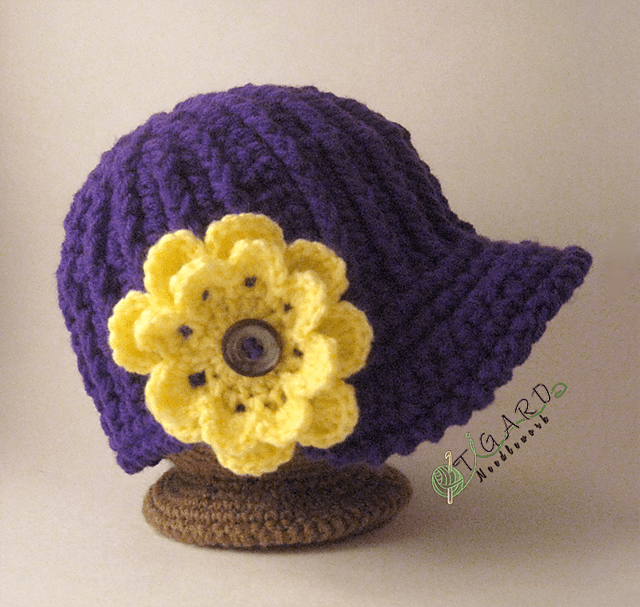 Free crochet your own adventure hat pattern and flower pattern. The flower pattern is really nice because it can be done with any hook/yarn. Basically, find a button you want to slip it over (did I mention it’s no sew? ), size your beginning chains, and then make as many layers of petals as you want (3 layers are supplied; I did 2 for mine.) How great is that? It could be used to make a variety of colours and then be changed out depending on season or outfit themes… yes. The potential is endless. Here’s the links you’ve been waiting for! Any grand plans for your crafting weekend? I’m still working on my pattern process posts at the moment, in-between crocheting and knitting, of course. Classes at uni start Monday for me, so I’m enjoying my last tastes of freedom and preparing for OFFF on Sunday, as well! There’ll be lots of pictures and coverage of that event on the blog, too.